As heavy rains from Hurricane Ike made their way through Fannin County in September, around two hundred people braved the weather to attend the fourth annual “Justice Is Served” at the Multi-Purpose Complex just west of Bonham. The event featured about twenty different judges, lawmakers, prosecutors, police chiefs and other officials in the justice system serving up barbeque and cold drinks. 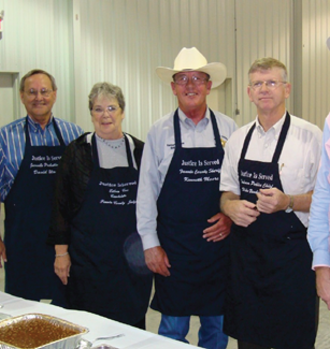 “Honorable Servers” included State Rep. Larry Phillips, State Senator Bob Deuell, 336th District Judge Laurie Blake, Fannin County Judge Butch Henderson, and Fannin County Attorney Richard Glaser. Proceeds from the evening benefited the Fannin County Children’s Center, a nonprofit agency dedicated to serving abused and neglected children. The center’s programs include CASA and the Children’s Advocacy Center. CASA recruits and trains volunteers to be advocates for children in foster care. The Children’s Advocacy Center works closely with law enforcement, child protective services, prosecutors, medical professionals and counselors to provide a coordinated response to child sexual abuse cases in a manner that is sensitive to the victims. Fannin County Sheriff Kenneth Moore served as auctioneer for the evening and was assisted by Warden Kenneth Karl and Justice of the Peace Joe C. Dale. Silent auction items lined the room to help raise additional funds to sustain the advocacy, forensic interviews, counseling and other support services for children, youth and families who are recovering from abuse and neglect. Major sponsors for the event were American Bank of Texas, Ray and Gloria Campbell, Henry and Elizabeth Donaghey Foundation, Glaser Family Charitable Foundation, Kevin and Paula O’Neil and R&K Wholesale. More than one hundred other businesses and individuals also contributed to the success of the event.